He had a scraggly brownish gray beard and glasses and wore a faded t-shirt with worn-out jeans. I was about 17 at the time, and I had stopped into the tiny used book shop not far from my home. It was a regular haunt of mine, this book shop where I’d scan the shelves, moving past best sellers and romance novels and looking for the classic treasures that I loved and could pick up for a dollar or less. It’s been so long ago now. I can’t remember how the conversation started or even why. Knowing me, I certainly wasn’t the one to initiate a chat with a stranger, especially as a teenage girl with a unknown guy in a store. But this I remember so clearly. For some reason, he asked me what I wanted to do. And I said, “I want to write,” in a whispered confession kind of way, the kind of admission you make in embarrassment because you know what you just said was crazy, impractical and surely impossible. In fact, I couldn’t believe those were my words. I didn’t know at the time why I said something so foolish and frantically searched for ways to escape the conversation. After all, I’m a practical person. I may have majored in English in college, but I wasn’t silly enough to think that meant writing. I told people maybe I could edit, or work in publishing, or go to law school, or teach…..all more logical options than dreaming the impossible dream. But I had said it, “I want to write,” and I didn’t know why or where it had come from or what it really meant, and I didn’t know how to take it back. This I remember, too. 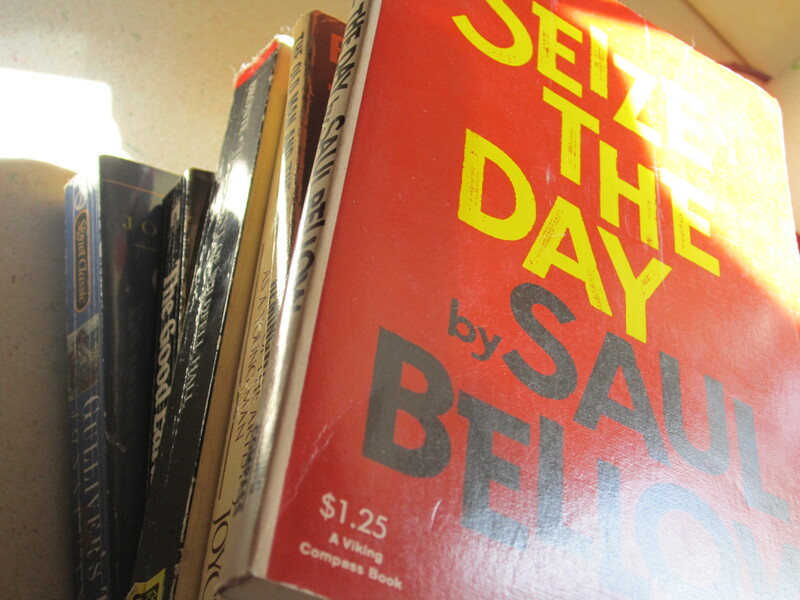 He said, “Well, what you have to do is read the best and just write and write and keep on writing.” Then he handed me a book called Seize the Day, which I took home with me and still have on my bookshelf, and then he walked away. I get emails now a few times a month from ladies asking me how to get published and could they do what I do, and I give them all the practical information I possibly can. Unfortunately I can’t give them “Ten Steps to Publishing Success” or “The Five Things You Need to Know About Christian Publishing” and I wish I could—really and truly. After all, I’m just a humble girl still plugging away at writing myself. All I can say is just obey and trust God and start small. Don’t dream about bestsellers or fame or personal glory or royalty checks. I started as that tired out mama typing away devotionals and articles in a word processor after my kids went to bed at night. I didn’t think anyone in the world would ever read them. Maybe one day I could print them off my own printer and slip them into a three-ring binder for my daughters to enjoy. Then someone asked me to edit for an online Christian women’s magazine. And then she allowed me to start writing articles. Then I felt like God wanted me to write devotionals and publish them online, so there was this blog….and then a book idea that took discipline to write in the middle of crazy busy days….then there were some other articles…. I didn’t think this was ever possible and it certainly wasn’t on my own. I have to tell you this secret—I cry every time I get the email: “We’d like to publish….” because I just know that it’s God’s grace and I can’t miss it. I didn’t plan for this, didn’t expect it, don’t deserve it…. I’m just amazed by it and so humbled by the reminder of how it’s all about Him. So, I stretch myself out face down on the floor every…. single ……time and cry out thanks to Him for grace like that. Maybe we all have “but God…” moments. They so rarely start with a grand vision of success in any worldly way. They start with the smallest steps of obedience, humbly just doing the quiet things and being faithful in the here and now, and then one day we look up and wonder how in the world all this happened—-and know it can’t be anything but Him. That’s the beauty of the “….but God” testimony; He gets the glory. And it’s the testimony of David, who “stayed in the wilderness strongholds and in the hill country of the Wilderness of Ziph. Saul searched for him every day, but God did not hand David over to him” (1 Samuel 23:14 HCSB). It’s impossible. We don’t deserve it. It’s hard and we’re weary. Maybe there are enemies; surely there are obstacles. But God….He is our Strength, our Hope, our Deliverer. May I take the time to humbly share some of these blessings from God with you? If you’re looking for ways to find some of my writings online or in print, here’s when and where to look…. I’ll have articles in both the May and June issues of P31 Magazine by Proverbs 31 Ministries. This gem of a magazine offers encouragement, Scriptural principles, and practical wisdom for Christian women. What an honor to be a small part of this ministry! Proverbs 31 Ministries is in the middle of moving offices and re-designing the magazine, so they aren’t open for new subscribers at the moment. Hopefully, though, they’ll be open to new subscribes again soon and issues are available for purchase individually online. My book, Ask Me Anything, Lord: Opening our Lives to God’s Questions will be published by Discovery House Publishers in November 2013! You can find my articles every month at http://www.myfrienddebbie.com/ and Ruby for Women, two online magazines for Christian women. I also have the honor of serving as a small group leader for online Bible studies for women at Women’s Bible Cafe (new studies starting in April!!!) and you’ll find me sharing book reviews there, as well. And of course I’m also on Facebook and you can find me on Twitter (@Heather_C_King) for Scriptures and quotes from Christian authors, and on Pinterest. Makes me humbly think of four words – Standing Rock Indian Reservation. Never imagined being a short term missionary at my age, after supporting my children and grandchildren to go on mission trips. God is surprising! Standing Rock definitely comes to my mind as a “but God” testimony! I love how He had you supporting missionary efforts for years and then commissioned you to go yourself!